Hi everyone, thought I would share my quinoa salad I made for dinner last night. I picked the spinach, garlic scape, and thyme from my garden. It was so delicious and satisfying. The ingredients used in my salad: spinach, quinoa, cranberries, pecans, feta cheese, red onion, served with an orange dressing. Cook the quinoa in a chicken broth and add a garlic scape to the water. Once the quinoa is cooked, set aside in a bowl to cool to room temperature. The orange dressing is really basic, add 6 1/2 tbsp orange juice, 2 tsp orange zest, 2 1/2 tbsp olive oil, 1 1/2 tsp thyme leaves, salt and pepper to taste. The measurements for the dressing are approximate depending on how large the salad is. Lay the spinach on the plate, combine all other ingredients together and toss with the orange dressing. Hope you enjoy. 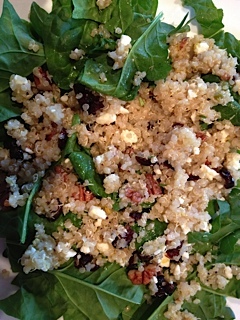 This entry was posted in Food, Recipes and tagged Broth, Feta, Garlic, healthy eating, Olive oil, orange dressing, Quinoa, Salad, Spinach, Zest (ingredient). Bookmark the permalink.